The book takes aim at many of the mainstream myths perpetuated about the lives of medieval women, such as, the idea that they lived horrible oppressed lives, and had little to no agency, or the notion that all medieval women were illiterate. Morrison does her best to debunk these claims by providing over 200 pages of examples, from the Early Middle Ages to the beginning of the Early Modern period. She touches on lesser known women, such as Gudrun Osvifsdottir, Iceland’s first anchoress, and Teresa de Cartegena, the first Spanish feminist, fitting them in alongside popular figures such as Hildegard von Bingen, and Joan of Arc. The final section of the book discusses intersectionality, gender studies, and the future of the study of medieval women with insights into historical texts and modern feminist theory under writers such as Gayle Rubin, Judith Butler, Kate Millet, Joanna Russ and Ann DuCille. 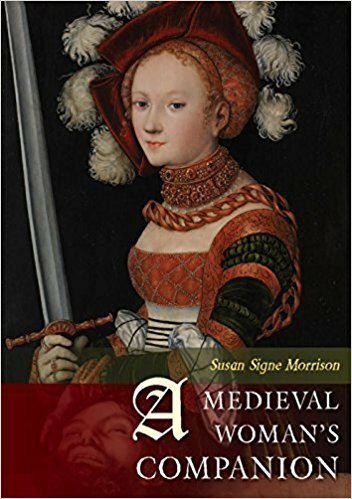 While this book doesn’t delve deeply into these issues, and is more of a ‘beginner’s guide to…’, Morrison does a superb job of making medieval women accessible to mainstream audiences, and tying in traditional and digital sources. Susan Signe Morrison is a professor of English at Texas State University and focuses her work on gender studies in the Middle Ages and Anglo-Saxon Comparative literature. She is the author of Grendel’s Mother: The Saga of the Wyrd-Wife.